행정자치부 통계에 따르면(2016년 9월 말 기준), 주민등록상 등록된 우리나라 1인가구는 738만 명을 넘어섰으며 전체 가구의 약 35%를 차지하는 것으로 나타났다. 지역별로는 경기도 21.4%에 이어 서울시가 21.1%로 1인가구 비율이 두 번째로 높은 것으로 분석되었다. 4인 가족이 기본 구성원 수였던 과거와는 달리 이제는 1인 가구의 수가 가장 대표적인 가족 형태가 되었다. BBREKA는 1인가구인이 급증하는 사회적 현상에 주목하며, 가족사진 스튜디오라는 형태의 시민참여 프로젝트로 시각화한다. 1인가구인과 그들의 애장품, 반려동물 등 사람 이외에 가족의 인연을 맺고 살아가고 있는 어떤 것과도 함께 찍을 수 있는 특별한 사진관을 통해 가족의 의미를 재조명하고, 1인가구인들을 인터뷰하여 그들의 이야기를 귀 기울여 본다. 팀 구성원인 작가 신재은과 최진연 모두 과거에 1인 가구로 생활했던 경험에서 비롯된 1인가구 사진관 프로젝트는 언론에서 비추어지는 1인 가구인들의 외로움이나 사회적 문제와 같은 부정적 측면이 아닌 각자가 가진 다양한 이유에서 나타난 새로운 가족 형태로 관점을 열어두고 그들의 삶을 미시적으로 바라보고자 한다. According to the statistics of the Ministry of the Interior, the number of single-person households exceeds 7,380,000 as of the end of September 2016, which accounts for about 35% of the total population of Korea. By region, the Gyeonggi-do province has the highest share of the one-person households (21.4%) and Seoul has the second highest share (21.1%). Now the single-person households have become the most representative type of the family in Korea, while 4-person households had been the most in the past. 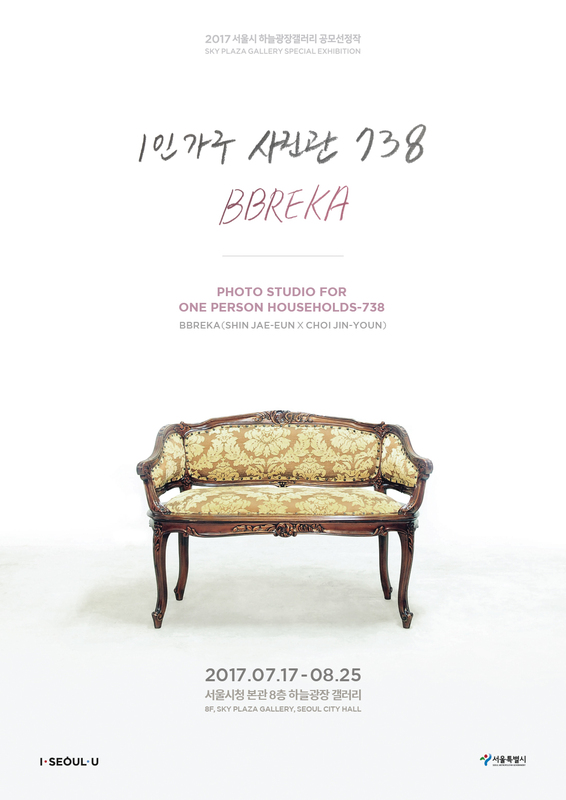 BBREKA pays attention to the rapid rise of one-person households, and visualizes this phenomenon by holding a citizen-participation exhibition in the name of Photo Studio for One-Person Households-738. Through this special photo studio exhibition, the artists interview with each single-person household to listen to their lives, and take pictures of them to shed new light on the meaning of the family not with human family members, but with their favorite belongings or pets. Both artists Jae-eun Shin and Jin-youn Choi from BBREKA, who also had been single-person households once, intend to look at their lives of single-households as a new type of family at the macro level, rather to see them as a social problem or a negative trend. 자신의 정체성을 상징하는 물건 또는 애장품, 반려동물 등 가족같이 살고 있는 사람 이외의 무엇인가를 하늘광장갤러리로 갖고 와서 1인가족 사진을 촬영(인터뷰까지 약 40분 소요) _ Please bring your belongings or pet(s) that represent your identity to Sky Plaza Gallery. We will interview you and take a picture for your family. It will take up to 40 minutes. 신재은 x 최진연으로 구성된 BBREKA는 그들이 직면한 상황을 파헤쳐 나가고 돌파해 나가자는 의미를 담고 있으며, breker(전동기기-압축 공기로 구동하는 착암기의 일종)로부터 변형된 단어이다. 일반적으로 팀 작업은 구성원들이 목표점을 향해 의견을 조율하며 한목소리를 내지만 BBREKA는 오히려 하나의 주제를 구성원이 서로 다르게 해석한 결과물을 보여준다. 80년대 생으로 아카데믹한 미술대학 과정을 거치고 도시 생활에 익숙한 그들은 많은 유사점을 가지고 있다. 공동의 작업 주제를 두고 공통된 관심사 배후의 각자 다른 주관적 관점을 시각화하여 드러내기에 그들의 작업은 팀과 개인 작업 형태를 모두 가진다. 작가와 작가가 만나 공통분모를 발견하여 공동이 되는 동시에 차이를 발견하고 개별화시키는 순환 작업은 인간이 사회를 구성하고 살아가는 모습의 축소다. The name of BBREKA which consists of two artists Jae-eun Shin and Jin-youn Choi means “examine the situation and break the situation,” and comes from the word “breker (a sort of rock drill).” BBREKA introduces different art results differently interpreted by two artists with one topic, rather than making one result as a team. BBREKA’s two artists were all born in the 1980s, studied at an academic art school, and are familiar with city life. They have two ways of works – as a team and as an individual – and visualize each other’s subjective point of view with the same subject and the same interests. They discover common interests, and have the common. At the same time, they discover differences and individualize their works. This is a microcosm of our lives.